This post is brought to you by my partners at RYOBI. All opinions are those of Thrift Diving. Some things are awesome when they’re vintage: clothing…furniture…cars…. Open my garage doors and you’d swear a freight train chugging through. Not cool, especially since our bedroom is directly above the garage. And I’m sure my neighbors don’t appreciate the sometimes-late-night open and closes. It was time for a replacement. Most things I love to DIY myself, not just because I enjoy doing them and learning about home improvement (can’t beat being self-sufficient around the house, too). And often times it’s usually cheaper, right? But this time, I went against my DIY nature and decided to hire The Home Depot garage door installers/contractors to come out and get the job done quickly and easily. And all I had to do was stand back and learn! Here’s what our garage door opener looked like before we replaced it! I’ve been working on my garage for–gasp!–three years, which is quite embarrassing at how little progress I have made. 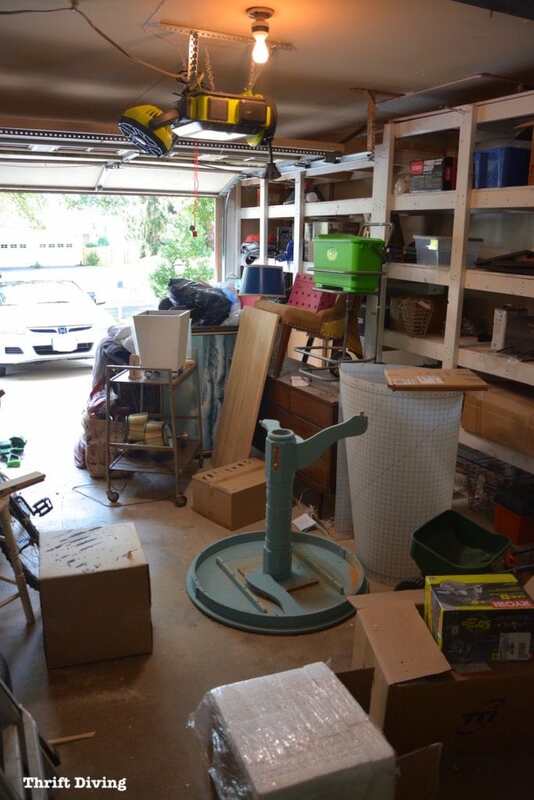 But garages are challenging to make over because where are you going to put all the dirty equipment and junk while you’re painting or resealing the floor?! Anyhow, I’ll work out those issues this fall! 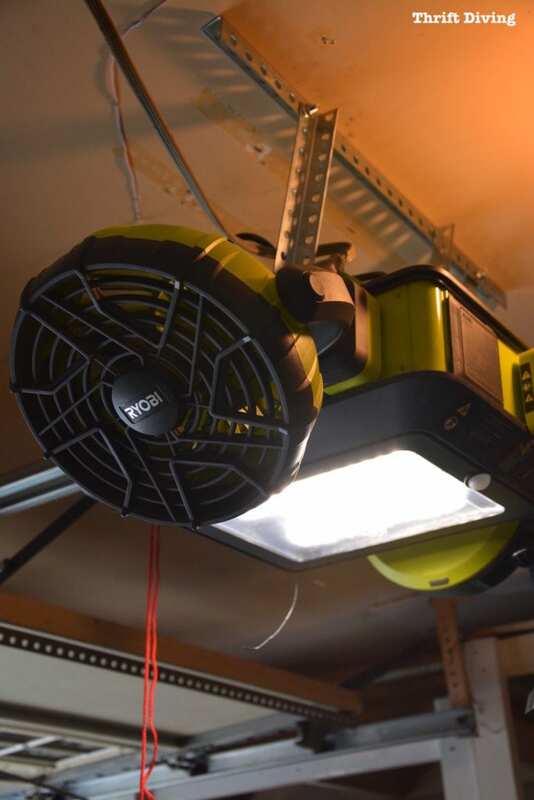 Here are some tips for having your own RYOBI garage door opener installed! 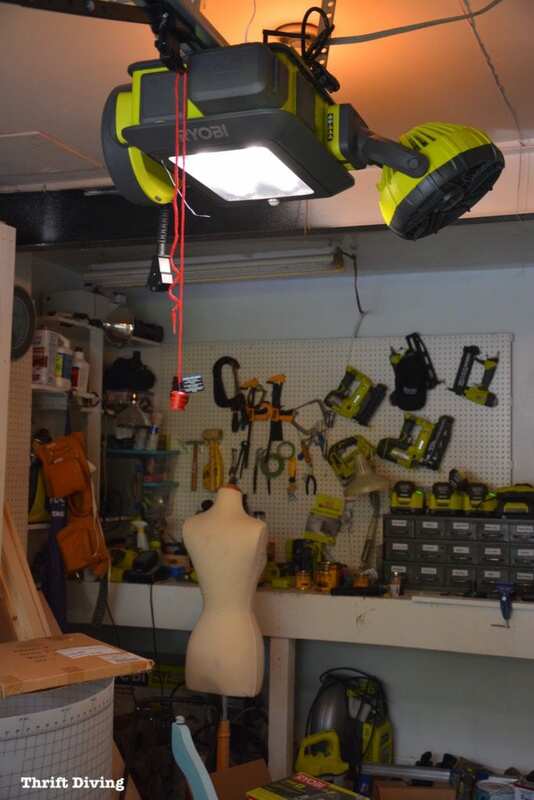 Call your local Home Depot and ask them for the garage installation. Be prepared for your jaw to drop when they tell you it’s only $117 for their contractors to install it. I had called around to a couple other places and was quoted upwards of $250, so yeah–$117 is affordable! But with The Home Depot, you need to pre-pay for your install, so be prepared to hand over your credit card info the day you contact them. Afterward, their contractors will call or email you to set up a time for installation. It was a super easy process! I know, I know….It sounds like common sense, but it’s easy to overlook this step! I hadn’t made time to declutter mine, so when they pulled into my garage, I had to quickly pull out a bunch of stuff to make room. You’re not just moving things out of the way of the door, but you’ll need to make enough room for the installers to set up a ladder. Make sure you have enough space for them to maneuver around the ladder, too! 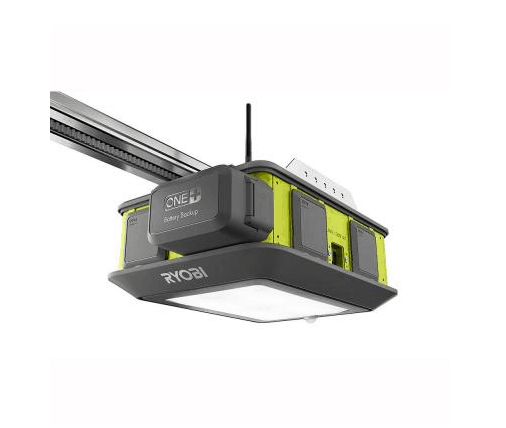 The RYOBI Garage Door opener is unique in that it comes with the ability to attach many different modules to the unit. These modules, such as the fan, extension reel, the Bluetooth speakers, and the Park Assist, are pretty sweet. But my favorite module is the extension cord reel! I’m always in need of one, and it’s cool to know I can pull one with THREE sockets right out from my RYOBI garage door opener! How awesome is that?! Also, remember to add a battery to the front battery compartment in case your power goes out. 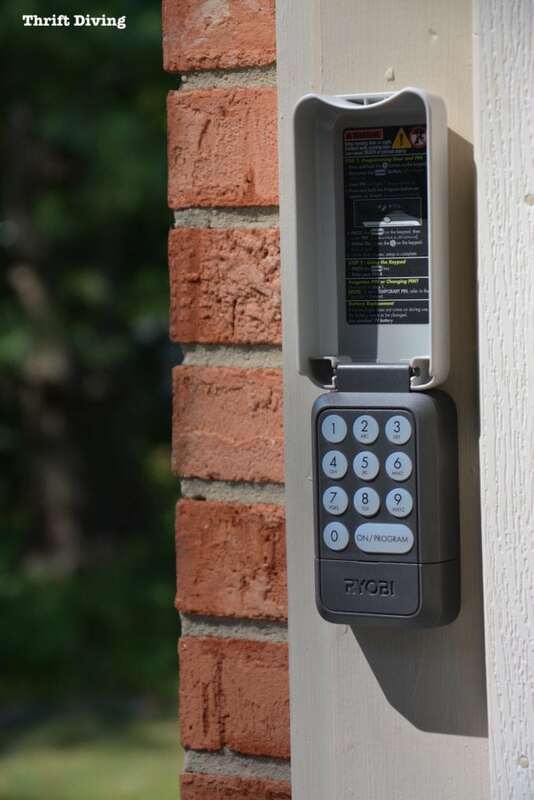 The backup 18Volt battery will allow you to open and close your garage door! Sweet! Just check the battery ocassionally to make sure that you’ve got sufficient power. TIP #4: Use the Free App! Ahhhh…..I love smartphones. What did we do before apps?? I remember as a kid when The Jetsons were soooo futuristic. Now, we can control our garage door openers with the push of a button on an app on our smartphones, even remotely, as long as we have a wireless signal! I’m notorious for forgetting to close the garage, only to question after I have already left whether or not I closed it. With the app, I can double-check just like that. 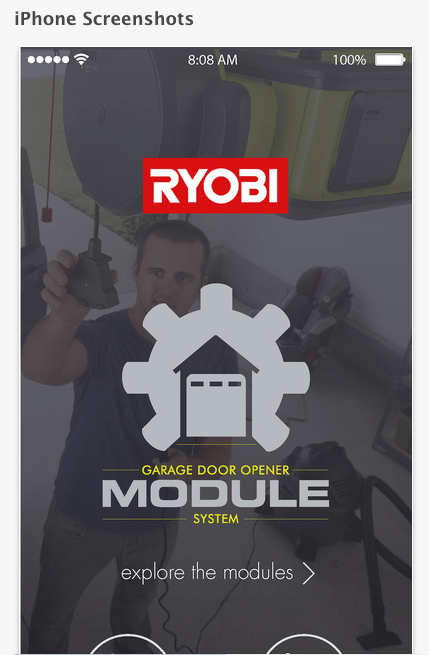 Download the free RYOBI GDO (Garage Door Opener) app from These modules or Google Play. TIP #5: Learn From the Pros! 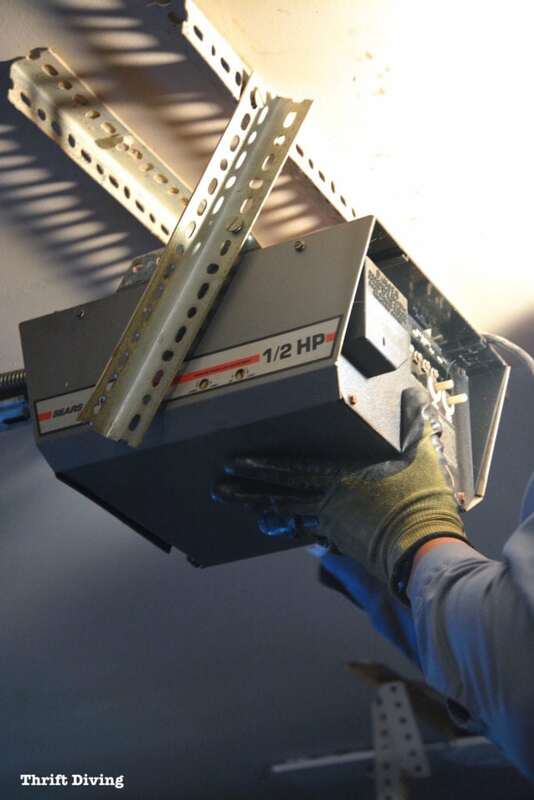 Don’t be afraid to shadow the professional installers that come to install your garage door opener. Not only can you learn next time how to do it yourself, but you’ll likely learn other great general tips and tricks. BONUS TIP #6: Watch the Video Tutorial Online! 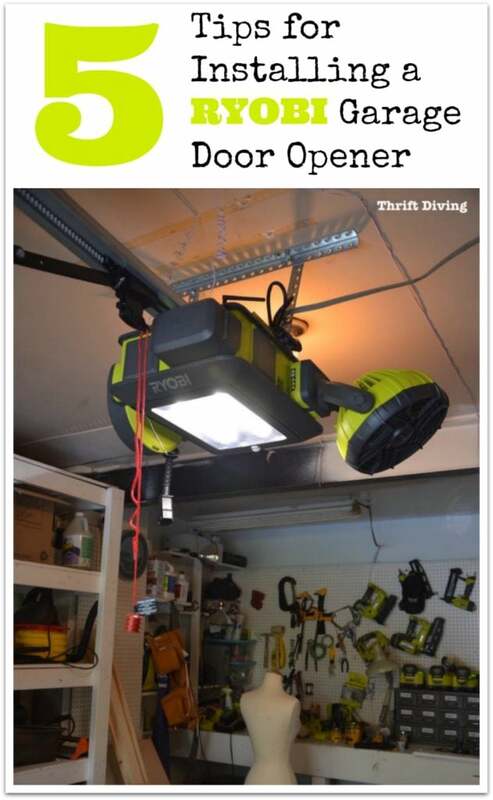 Of course, if you want to install it yourself, RYOBI has an awesome instructional 20-minute video on how to install the Garage Door Opener! Just make sure you have a second person helping; you’ll need it! 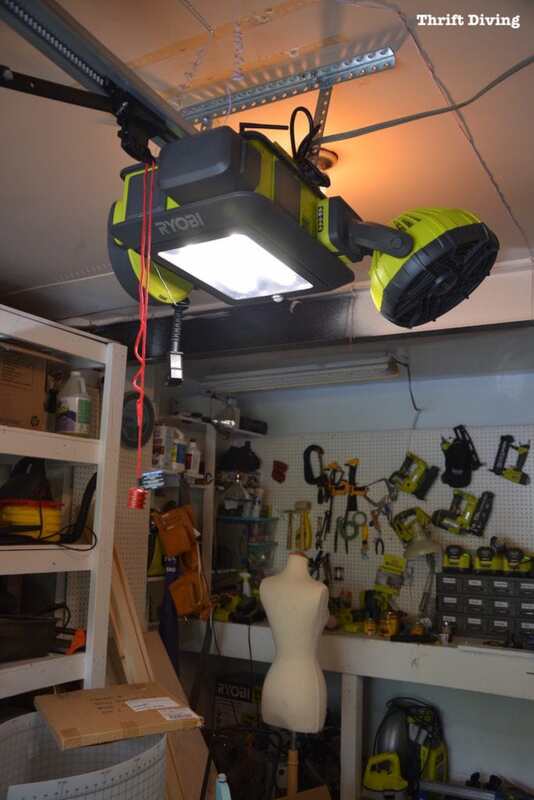 I’m truly impressed with how quiet this RYOBI garage door opener is! There are some beeps that will alert you that it’s opening and closing, but that’s nothing compared to the sound of the other one opening and closing. I can’t wait to convert my garage into a pretty workshop and get everything in there set up! I’ll keep you posted. It’s going to be the focus of my entire November to get the garage cleaned out and ready to be my work space! I have shared on my facebook page. I really need to replace my 16 year old opener and this one would be awesome!! Hey, Melissa! Good news! You’re the winner of the RYOBI garage door opener!! 🙂 The other winner never responded, so I had to pick a new winner! Please email me at [email protected] to claim your prize! Send me your mailing address! 🙂 Congrats, girl! I have shared on my facebook page. 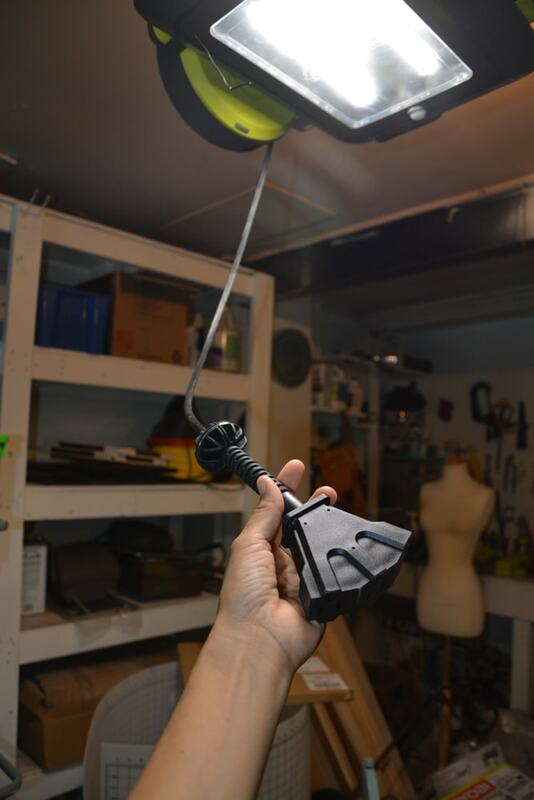 I love the versatility of this garage door opener, I cannot choose just one feature. Best feature would be the APP – and 2nd best, the idea that it wouldn’t sound like a freight train anymore! Lol favorite part is that it works. Mine gave up the ghost years ago. I posted to facebook.